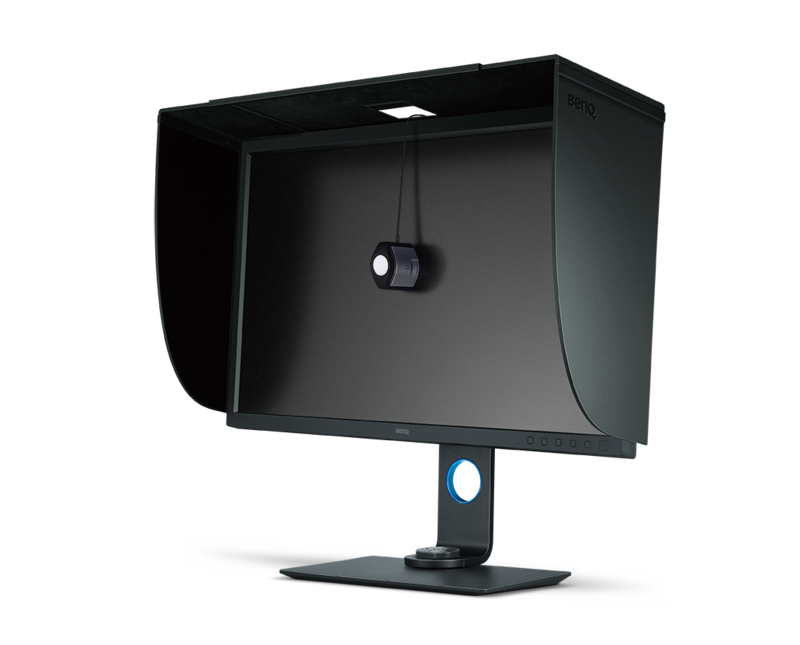 BenQ, internationally renowned provider of digital lifestyle devices, today announced the SW320 photographer monitor, a 31.5-inch 4K display with class-leading color performance and High Dynamic Range (HDR) capability. Spanning a wide color gamut covering 99% of Adobe RGB and 100% of sRGB, Rec. 709, and the digital cinema industry’s DCI-P3 color space, SW320’s true 10-bit IPS panel and advanced 14-bit lookup table (LUT) deliver spectacular color quality with precise ≤2 Delta E values. 99% Adobe RGB Color Gamut and Technicolor Color Certification. SW320 delivers an ultra-wide color gamut to reach 99% of Adobe RGB, a significantly larger color space than sRGB and Rec. 709. Also supporting DCI-P3 as well as 100% of sRGB and Rec. 709, SW320 is certified by Technicolor to meet strict standards for color accuracy used in Hollywood and throughout the media and entertainment industries, with consistent, precise color exactly as content originators intended. High Dynamic Range (HDR) content support. Increasing the dynamic range between black and white for naturally realistic images, SW320 supports HDR signals through both its HDMI and DisplayPort inputs. True 10-Bit Color Depth, 14-Bit 3D LUT, ΔE ≤ 2. Producing over a billion colors for ultra-smooth gradations, SW320’s 14-bit color lookup table guarantees absolute color accuracy as defined by Comission Internationale de l’Eclairge’s (CIE) Delta E deviation of less than 2, designating the finest color fidelity exceeding the limits of human vision. Palette Master Element Color Calibration. SW320 can be hardware calibrated with a colorimeter and Palette Master Element calibration software for professional work. Brightness Uniformity Function. For an authentic and consistent viewing experience, SW320 achieves immaculate brightness uniformity across the entire screen via a meticulous fine-tuning process of hundreds of sub-regions with high-precision apparatus. Hotkey Puck and Pro Shading Hood. 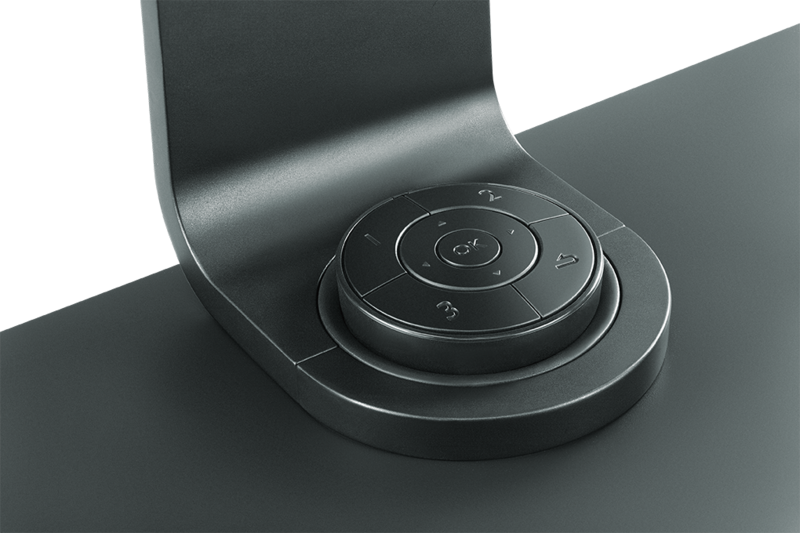 The unique “Hotkey Puck” remote control enables instant switching between color modes and image settings, and the included detachable shading hood works in both portrait and landscape orientations to block ambient light and glare for superb color accuracy. Finished in a minimalist bezel and adjustable stand design engineered to reduce reflection, SW320 provides comprehensive connectivity, including a media card reader, USB 3.0 ports, HDMI 2.0a, and DisplayPort / miniDisplayPort 1.4 supporting Mac Thunderbolt output.